I would not know that a very yummy Banh Xeo exists if not only for my Vietnamese friend, Trang. She invited me to join her on her trip to Mui Ne to escape melancholy brought by amazing people we have met along the way. First morning we were in Mui Ne, our gut was yelling for food (specially mine, since I am up 5am waiting for Trang to get up who happened to wake up at 7am!). I almost jumped for happiness to see her get up, I know I could have ride the motorbike and left her dreaming and snoring if only I know how to work a manual motorbike! Anyway, so we rode the motorbike to see what will fill our guts that morning. Trang would not want to miss trying the specialty of the province which is Banh Xeo, so she oredered one for both of us. One order was with 4 Banh Xeos that cost 20,000VND ($.90 USD) Banh Xeo is a very healthy food, mongo sprouts, herbs, spices, and pieces of meat wrapped with coconut-rice crepes. When we stopped at the Banh Xeo lady’s mini-shop, it was pumping! So I thought that should be good. It was fun watching her cook it, the Banh Xeos were cooked on a several small pans with small covers. The lady would pour the liquid mixture of the coconut-rice flour on the pan, put the vegetables, hers, spices, and the meat, cover it for few minutes, and then roll it. The aroma itself was so good to tempt you to try some of those amazing healthy Banh Xeo. 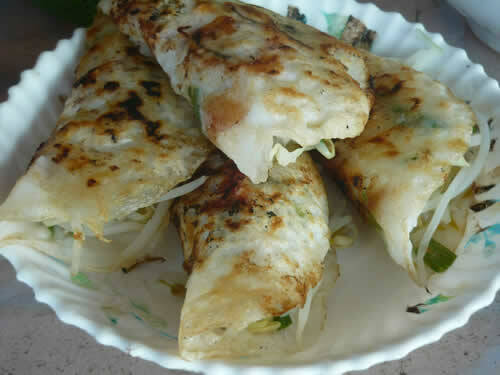 Ban Xeo means “sizzling pancakes”, which is why the aroma was so good that itself was mouthwatering. It was served to us with sugar cane vinegar and fresh herbs. I could have eaten all of those yummies, except I need to help Trang to finish with her Pho, Vietnamese noodles that she ordered for us. I didn’t get to help her out though, so full. Anyway, the next time I go back Vietnam it will surely be on my menu list!